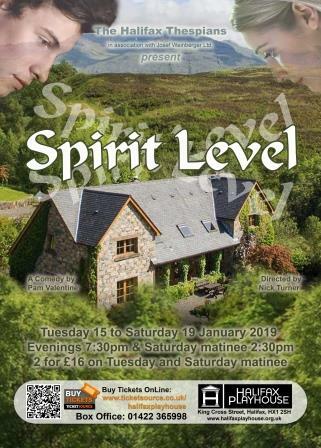 From Tuesday 15 to Saturday 19 January 2019, The Halifax Thespians present their amateur production of the spirited comedy play by Pam Valentine at the Halifax Playhouse. Famous crime writer Jack Cameron and wife Susie are haunting their old cottage – they couldn’t get into heaven because Jack is an atheist. Their only pleasure is spooking the estate agent, till one day a young couple move in. Christmas brings a snowstorm, a baby, and a crisis, causing Jack to do something no card-carrying atheist would ever admit to. But will it help? Evenings 7:30pm, Saturday Matinee 2:30pm. Tickets are £10, except on opening night & Saturday Matinee when £16 for 2 tickets and are available through TICKETSOURCE.